LAKEWOOD, Colo: – The sounds of dribbling basketballs and the voices of women yelling, “ball, ball ball!” And then, “shot!,” ring out through the gym. Instead of the accompanying squeak of sneakers on the courts, the smell of burning rubber permeates the air as the players glide swiftly across the court in wheelchairs. 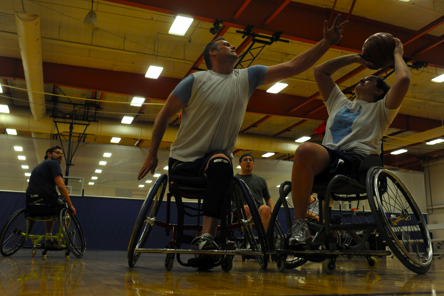 It’s the first day of the 2011 National Wheelchair Basketball Association Championships held at the Gold Crown Fieldhouse in Lakewood, and competitors from across the nation have flown out. In the middle of the chaotic scene a group of women gather next to the middle two courts, all of them sporting the signature blue and gold colors of the Denver Nuggets. This year the Lady Rolling Nuggets will be representing Colorado in the National Tournament. The team is “stacked” this year as one of the players put it. There are at least three women who were on the U.S. Paralympic team in the last Paralympics and a few more who have either played professionally overseas or have spent time in the past on the U.S. team. Fade away shot works every time. 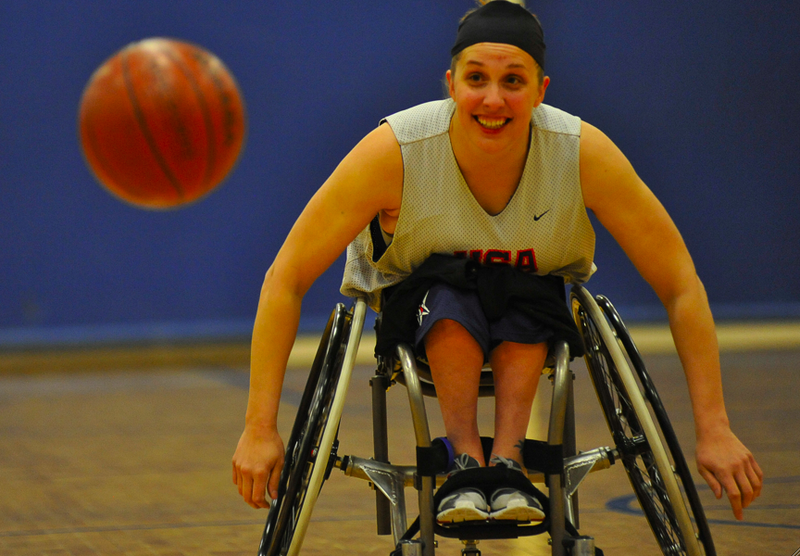 In 2010 Jennifer Chew, Christina Ripp and Natalie Schnedier were all on the U.S. Women’s Wheelchair Basketball National Team. 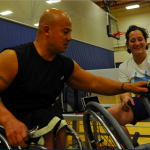 Patty Cisneros, now a fifth grade teacher, has won at least three gold metals in the Paralympics since 2000 and has played professionally in Germany. “It’s just second nature,” says Cisneros about the sport. The accomplished athlete just moved to Denver in the fall of 2010 and has played with a number of the U.S. players who are now on the Lady Rolling Nuggets in the past. The team teases her for her intensity on the court, joking about her need for the ball and high scoring abilities. 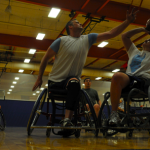 According to the NWBA website, the first game of wheelchair basketball was played in 1946 by the California Chapter of Paralyzed Veterans of America. After that the sport spread like wildfire in popularity to hospitals around the country then across seas. Today the association is comprised of over 200 teams across the country including men’s, women’s, intercollegiate and youth teams according to the website. Class three athletes are those who have considerably more movement, “all lower extremity amputees are included in this class except those with bilateral hip disarticulation” as stated on the NWBA website under “official rules.” The points are added up with a certain maximum number (depending on the division level) allowed at any time on the court to keep the game fair. The Lady Rolling Nuggets are confident in their chances in winning the National Championship, especially by the end of the day, after they win all of their three games by at least a margin of ten points. Though the team has a considerable level of seasoned wheelchair basketball veterans, there are newcomers, like Molly Bloom, who has only been playing for three years. A few tweaks, and the Lady Nuggets are rollin' good as new. Most players have been playing for much longer, but Bloom wasn’t injured until her senior year of high school where she lost her leg in an accident on prom night in May 2006. Though Bloom hasn’t been playing for long, she is a starter at all of the games. It’s obvious that the team is much more than just gold metals and titles, they have heart, too. To Bloom, who has always loved sports and was a swimmer throughout high school, the best part of being on this team is the camaraderie and what her teammates have been able to teach her off the court. Arms pumping, racing, weaving and dribbling down the court, these women make it look easy. The crowd roars every time they make a basket, which is quite often. At the end of the last game, after the women wrapped up their win against Arizona, the team was all smiles though their constant 10 point lead was a little too close for some. A couple of the players commented that they had been nervous for a bit during the game and they were glad they pulled it together by the end. As their Coach, Justin Obermeyer wraps up the team meeting and asks if anyone has anything to add? 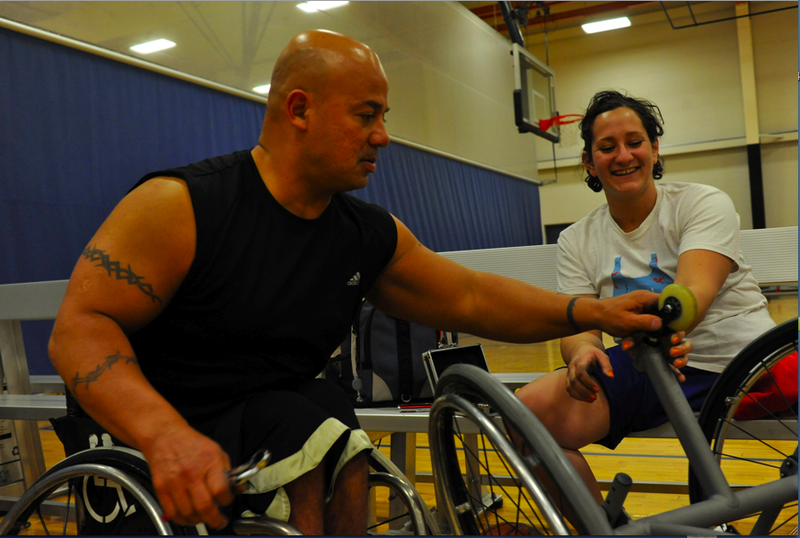 And they bring it in for one last cheer to end their first successful day at the 2011 NWBA Championships.